Adults have many and varied reasons for studying English. Adults bring a wealth of knowledge, life skills and experience with them. Teaching adults is one of the most interesting fields of ESL teaching. English for Adults combines topics such as “Why English is the Global Language?” and ESP (English for Specific Purposes), EAP (English for Academic Purposes). Adults have very specific goals when learning English and need to feel confident that they can reach those goals. Areas of teaching include teaching the four language skills and preparing engaging lessons for adult learners. Full of resources including an entire chapter of lesson plans and activities, English for Adults has everything needed to design and prepare ESL lessons for adult learners. Q: What kind of activities are appropriate for the adult classroom? A: English for Adults covers a wide range of activities, lessons and resources for the adult classroom. Q: What do I do if problems arise in the adult classroom? 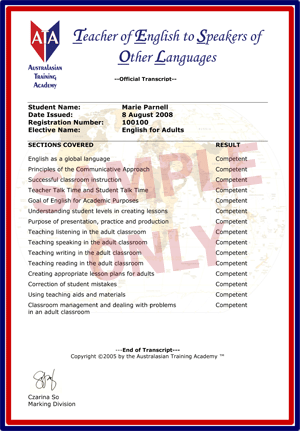 A: English for Adults covers problem situations and how to deal with them effectively in the adult classroom.